Pines are one of the classic tree genera used for bonsai throughout the world, however they are also one of the most difficult to understand how to style and prune. Deciduous species (and many conifers, such as Junipers), continuously produce new leaves and shoots throughout the growing season which require continual removal using techniques that can be applied to a tree, whichever variety it is. These techniques however are inappropriate to the growth patterns of pines. Unlike deciduous species, most Pines in Northern temperate areas have only one flush of growth and a different set of pruning techniques need to be applied accordingly. Pine pruning techniques in reality are very straightforward, however trying to learn them can be very confusing as there is so much contradictory advice offered in Bonsai publications and books. 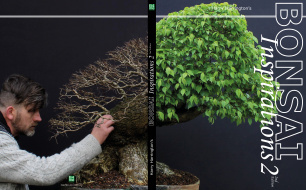 This confusion normally arises from the attempt of Bonsai publications to be too specific about the precise time of the year that certain techniques should be carried out. Unfortunately, different pine species require pruning at slightly different times of the year; different climates will also affect the advancement of Pine growth through the year and this also causes creates confusion when trying to follow advice that has been written for a different climate. My personal opinion is that it easier to learn to prune pines by observation of the growth pattern of your own tree in your own environment. This ensures that your tree is pruned correctly, at the right time, when your tree is ready; and not simply because it is a certain time of the year. This article concentrates specifically on techniques for pruning Japanese Black Pine (Pinus thunbergii), but these techniques can just as equally be applied to other Pine species if simple observation of varying growth rates between different Pine species is noted. Japanese Black Pines are a vigorous species, particularly in warm climates, other two or three- needle pines with sufficient vigour will respond similarly. Pines are extremely apically dominant. This means that their most vigorous area of growth is always towards the top or outer-reaches of the tree. If the tree is left unpruned, all growth will be centred on the apex/top of the tree at the expense of the lower branches and foliage, which, in time will weaken and dieback. An unpruned or poorly pruned Pine will nearly always display characteristics of heavy top and outer foliage, with little inner growth near the trunk, which is unsuitable for bonsai. Pines are able to produce buds from anywhere that there are still needles though it is rare for buds to break anywhere other than the tips of shoots. It is very difficult to force Pines to bud-back on the trunk or branches; without careful pruning, branches can be completely bare other than a ball of foliage at their very tips. Area 1 is the most vigorous. Area 2 has medium vigour. Area 3 is the least vigorous area. Typically, the other major fault with unpruned pines that needs to be avoided is the natural tendency to produce 'whorls' of buds at the end of branches which elongate into multiple sub-branches that look ugly and create problems with inverse taper at the point in the branch (or trunk) that they emanate from. Due to these growth characteristics, it is necessary to start shaping pines from an early age, pines that have left unpruned whilst developing their trunks can have little or no branch structure that is suitable for use when it comes to styling the tree. Often, in these cases grafting is the only way of encouraging branches low down on the trunk. Area 2 is of medium vigour. Area 3 has the least vigour. The best way to develop a thick trunk on a pine whilst retaining suitable branches low down on the trunk is to cultivate lower and inner shoots as future branches whilst allowing top other branches to extend freely as sacrificial growth that can be removed at a later date. Pruning of branches is nearly always carried out when the trees' growth slows down in late Autumn through to Spring to avoid excessive sap-loss. When pruning in Winter it is always best to leave a small stub rather than cut back close to the trunk. Leaving a stub when pruning pines is advantageous as it leaves open the opportunity in the future of creating jins and it also allows time for the sap-flow to bypass the missing branch, reducing sap-loss through bleeding. Pruning close to the trunk and hollowing out is best carried out whilst still semi-dormant in early Spring as scars will heal quickest with the Spring growth that follows. It is better to be conservative when hard-pruning and reducing Pines. Severe reduction without allowing for recovery time can be fatal particularly with old or large trees. Reduce large trunks and/or branches gradually over a number of seasons so that the tree is able to adjust. As well as being a useful tool for shaping and positioning trunks and branches, wiring is an effective way of distributing energy and vigour throughout a pine. When the trunk or branches of a Pine are wired, the flow of sap through these branches is slowed so that not all the trees energy goes directly to its branch tips. There are many schools of thought as to when the correct time to wire a Pine is. Some say that you should only wire in late Autumn or Winter as whilst the cambium is less active during this time, damage is reduced. Other bonsai enthusiasts recommend wiring during the Summer when any damage to the branch can be repaired immediately by the tree as it is still actively growing. My personal feeling is that it is better to wire during the late Autumn and Winter; pine branches tend to increase in thickness quickly during the late Summer and there is a greater risk of wire damage. Wiring after this time means that the wire can nearly always stay in place until the following Summer by which time the branch should have set in place correctly. The pruning of pines for foliage and branch formation can be split into four basic areas; bud selection, candle pinching, shoot trimming and needle plucking. The development of foliage pads or branch structure on a bonsai dictates that the branch tips should fork and sub-divide into only two smaller sub-branches. As previously stated, Pine buds most often emerge in clusters or whorls at the end of branch tips. The basic rule in Bud Selection is to select two of the buds and remove the rest so that when the buds extend as shoots they form a two-pronged fork. Buds continually need to be reduced to two as they appear, in Autumn and in Spring. Deciding which 2 buds in a bud cluster should be retained needs some consideration. As previously stated pines are apically dominant, upper and outer areas can (and should) be restrained by careful bud selection and elimination. Apical areas of a pine can produce 5 or more buds to a shoot terminal, by removing the largest and strongest buds and retaining the two smallest and weakest, vigour is re-directed to wards inner and lower areas of the tree. Conversely, weaker lower branches are allowed to retain their largest, most vigorous two or three buds to encourage more vigour to them. If a third bud is retained on a weak branch it can be removed at a later date when its job is done. To encourage good branch structure and proper formation of foliage pads, whenever possible, buds that appear on the sides of a shoot should be retained rather than those than on top or below. Image 1: Appearance of shoot tip before bud selection in Spring. Image 2: After bud selection. Image 3: After extension of the buds into new sub-branches in Summer. Note the appearance of a further set of buds developing at the new shoot-tips.